Baghare Baingan is one of the most famous dish from the cuisine of Nizams, the Hyderabadi cuisine. The cuisine is well known for its rich flavors and meticulously planned and prepared dishes, be it Hyderabadi Biryani, Kormas, Dum-pukht vegetables or rice, meat dishes, halem or even the desserts. Each dish calls for great precision in terms of quality and quantity of ingredients, use of spices, duration of cooking etc. Often the unbeatable flavors of food comes from the prolong cooking or slow cooking, wherein each ingredient gets ample time to not only infuse its individual characteristic flavor but also gets chance to marry other flavors, resulting in most aromatic dishes, bursting with flavors that are perfectly balanced. 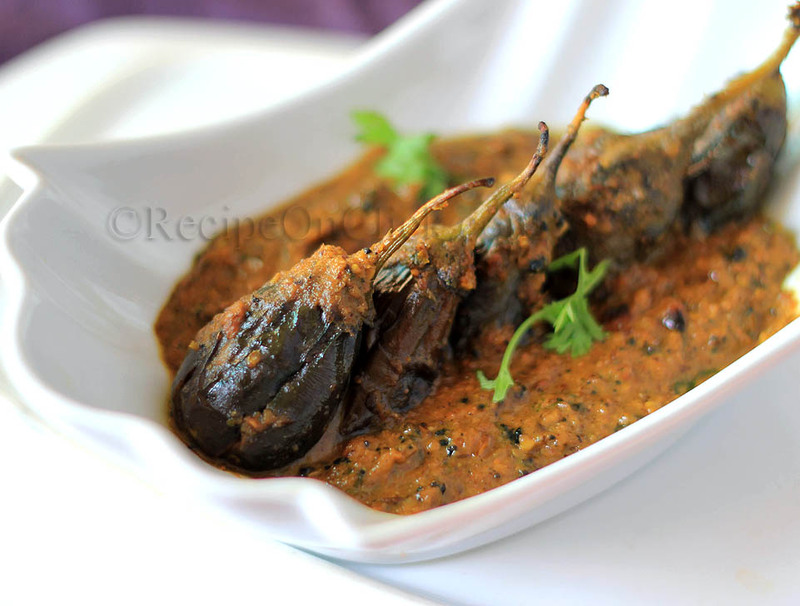 Baingan or Brinjal or Aubergine takes one of its most gorgeous avatars in Bagahare Baingan. The nutty flavors of roasted peanuts and sesame seeds, the sourness of tamarind, a hint of sweetness from jaggery, mild pungent flavors from onion and garlic, makes this curry one of the most delicious way of savoring brinjal or eggplant. This Recipe is highly influenced by Chef Sanjeev Kapoor’s recipe of Baghare Baingan, with just few tweaks here and there. And trust me if you can, it had bang on flavors and awesome texture. Lip-smackingly good, I must say! In a pan, dry roast peanuts, fenugreek seeds, coriander seeds, cumin seeds, sesame seeds and Poppy seeds (preferably in that order) on low flame, till lightly roasted, giving out a nutty aroma. Add dessicated coconut and roast till light brown. Set aside this mixture to cool off. Grease the same pan lightly with oil and roast, sliced/chopped onions till translucent. Scrape well if the onions tend to stick the pan. Now grind/blend all the ingredients except oil and eggplant , to make a moist paste. Rinse well with water, the whole eggplant, and wipe dry with clean kitchen towel. Slit each eggplant (from the bottom, broad end), towards the crown, till halfway (or beyond). Now stuff each eggplant with the paste and reserve the remaining paste for the gravy. Heat around 2 tbsp of oil in the pan and gently fry the stuffed eggplants on medium heat till half done. Now add the reserved paste and mix gently. Let the mixture cook for a while and then add around 1 1/2 to 2 cups of water. Simmer the gravy till oil starts separating out and the eggplants are done. Garnish with coriander leaves before serving.